i have racked my small excuse of a brain for a fourth circle in my venn diagram that would intersect with the three that i have managed (struggled) to come up with, but to no avail. at this point i can only conceive of three distinct flavours of cyclist that characterise the persona, but distinct only in that they meet in the middle. this is not one of those smash hits type questionnaires where you have to find to which category you belong; that would be silly. but it does have bearing on the logical outcome of that which follows. the obvious starter for ten is the racing cyclist: this person (i'm aware that numbers extend far beyond one, but i have no wish to dig myself into a grammatical hole by means of multiplication) either races occasionally, regularly, or not at all. the last statement is not at variance with my theory, since wannabes do everything by the book, but on their own. this discipline requires acting on every article ever read in the cycling press regarding fitness, nutrition and training, even if these are seen to be contradictory. regular five hour rides, interspersed with the occasional fartlek (brussel sprouts at christmas lunch) and hill reps provide an inner glow that is hard to disguise. or conversely, they feel like sh*t and just want to sleep all day. numbers are the controlling factor in their racing careers, whether it be heart rate, power output, cadence, distance, average speed. i feel i need expound no more. you'll know if this is your category even if you're loathe to admit it in polite company. second circle on this mythical venn diagram is the bicycle obsessed. a degree of fitness and modicum of speed is a welcome state of affairs, but merely as a means to an end, and rarely, if ever, an end in and of itself. the way the tubes are joined: lugged or tig welded; smooth or chunky aluminium welds; monocoque carbon, lugged or wrapped joints. is the bottom bracket italian or english thread, still square taper or fixed to one crank; perhaps even a bb30. this individual can often recite the frame angles of a pinarello dogma as compared to those of a cannondale six. don't get me wrong, this is not a state of affairs to be ashamed of or to be pitied. granted it is the cycling equivalent of a trainspotter, but they have fun too, don't they? it's the converse of lance'sit's not about the bike. and thirdly, there are those who care not one white for either of the above. the bicycle itself is a means to an end, a way to get out and about under one's own steam, so to speak. to travel the well trodden path to and from work, or the great outdoors to be visited at weekends and holidays, perhaps laden with the majority of personal effects. fitness and nutrition here come as a by-product and are to be encouraged and enhanced only to the point where the world can be enjoyed from the saddle without incumbent exhaustion. 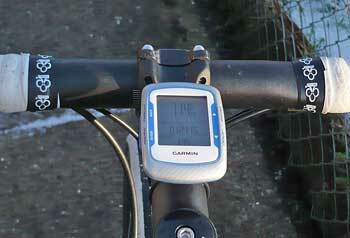 so what in the heck has all this to do with a garmin 500 gps unit? quite a surprising amount, you may be encouraged to hear. gps cycle units as a whole, and there are not that many who have entered the fray, are perhaps our equivalent of the black box flight recorder. the latter device is pretty much ignored until something goes wrong, or recorded parameters require verification. in the case of the edge 500, this is probably just as well, because some of those numbers are awfully hard to see when you're pedalling slowly, let alone at speed. effectively, there are three windows which can be switched between at the press of a button. how easy it is to press those buttons, depends on the plushness of your winter gloves. there are two bumps on each side of the device with a combination of functions depending on what the required outcome is. each window contains a maximum of eight data fields, and in each of those data fields, you can choose from up to 41 different sets of data. numbers such as time of day, heart rate, distance, speed, elevation, calories; even the surrounding temperature: i'm sure you get the picture. the default setting when new is five fields to a page which seems the sensible option to me, giving one large, easily readable number at the top, accompanied by four smaller readouts below. when the weather's dull and cloudy, reading these is not too much of a chore, theough the smaller ones will depend on how dark those oakleys are, and how good your eyesight still is. when it's sunny and bright, the best you might manage is your puffing and panting reflection. however, as i mentioned above, think of it as a black box flight recorder, and you'll get on much better. this is because, with the aid of nothing more than a small black usb cable and a computer, all the information recorded (you did start the timer didn't you?) can be downloaded and analysed to the nth degree. 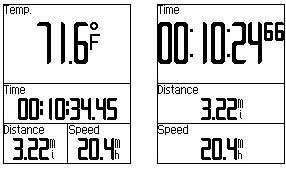 you can also set training parameters: a set of beeps when above or below the desired numbers. the first of our categories above will obsess over such binary digits and displayed prowess. or perhaps their coach will. the 500 is smaller than its big brother, the edge 705, partly because the display is smaller, and partly because it doesn't do maps (which were never a cheap option anyway). 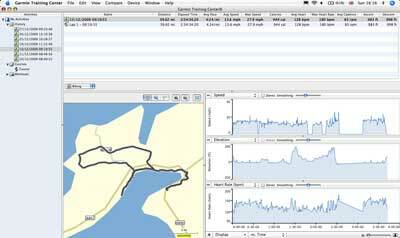 it can provide a gps reading to help ascertain geographical location (our third group of riders), and the computer software can later use this to overlay your route on a map, should you be at all interested. category one riders (see what i did there?) will be happy to employ the enclosed chest strap for heart-rate information, the chainstay mounted sensor for cadence and speed. should the 500 fail to acquire any satellites, or when the obsession and weather do not coincide, and you have to employ a turbo trainer. the speed sensor works on the rear wheel for just this reason. unfortunately, on the bike i used as a testbed, the shape of the chainstays prevented my fitting of the magnet, because it clouted the sensor arm on each wheel revolution. moving the sensor rearwards to avoid this, would have prevented the selfsame sensor from lining up with the pedal cadence magnet. while we're on the subject of the latter, please read the manual properly before fitting like i didn't. the crank magnet and sensor have to be lined rather precisely to get any readout at all; you'll feel like a total chump when you discover this several kilometres into a three hour ride. because garmin units are ant+ enabled, any similarly enabled accessory can be identified by the head unit; this is how the hrm and cadence both work. but there is a third option set to no by default and that involves your power output. or lack of it. i didn't take this any further this time round, but the saris power tap series of rear wheels are also ant+ compatible, so fitting one of those means you need wheel only, with readout and data storage handled by the garmin. a notable area of improvement over the 705, is the stem fitting bracket. after only a few months, the 705 implementation suffered greatly from plastic deterioration, resulting in it experiencing a couple of tumbles onto the ground under speeding wheels. 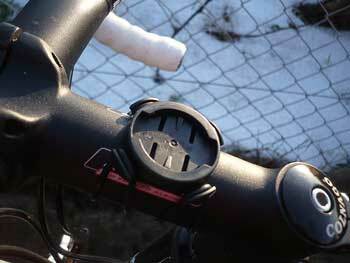 the 500 comes with a mini heli-pad strapped to the stem by means of little back bungee cords. the underside of the unit owns the female to the stem's male: slotting the unit in at right angles, then twisting clockwise holds the whole edifice very firmly to the bicycle. there was no rattling and no sideways movement when pressing random buttons while in-flight. success, i would say. our middle category of rider would seem to be the odd one out with regard to this machine, but no matter how sophisticated data recorders become, there will always be some of us (who, me?) for whom numbers just get in the way. the depending factor is just how much of an intersection you have with one and three, and how necessary those hated numbers become. the edge 500 costs around £250, and arrives with usb/charging cable, software on a disc (windows and mac compatible), cadence/speed sensor, two mounting brackets and attendant bungees. all you need now is to fix yourself in one of the categories above and decide how much of an overlap you're willing to cater for. oh what the heck, buy one anyway, you know you want to.